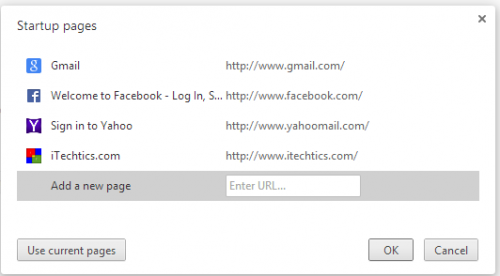 Are you tired of typing in several URLs every time you log on to your system? Yes, we all open a specific set of websites to check our emails, Facebook, Linked-In or Twitter etc. So, why not find a solution which would open all these desired websites automatically when we log on? Some browsers offer Speed-Dial where you can add your favorite websites and can open website by double-click on the dial. Open the chrome browser and you will see thumbnails of recently opened websites there. But, you can not add or edit a thumbnail. All you can do is a click and open website. How to open Chrome automatically at Start-up? How to open websites automatically when Chrome launches? 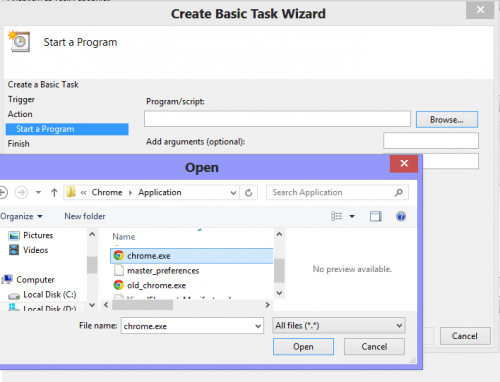 We can open chrome automatically by adding it into the start-up program list using Task Scheduler. 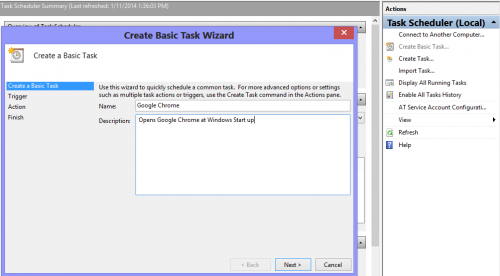 Task scheduler is a free built-in tool by Microsoft Windows. 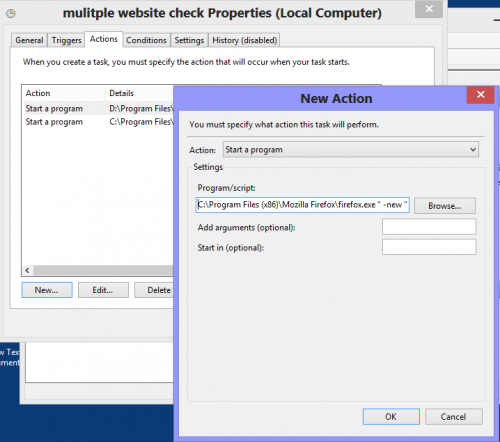 Task scheduler runs in the background every time you start Windows and therefore you can schedule your required task to be executed at specified intervals. We will schedule the chrome as Task that runs when ever system starts. Or type ‘taskschd.msc’ in the search option of Charms bar. In Action, select Start a Program. Type chrome://settings/ in the web address bar. Select ‘Open a specific or set of pages’ on start-up. Click Set Pages -> Add desired pages by typing their web address. If you want to set all the currently opened web pages , click ‘Use Current Pages’. Initially, our target browser was Google Chrome but what if someone has any other browser like Opera or Firefox. So now, I am going to blend the solution in a simple way that would be applicable to all browsers. We will make use of the Task Scheduler again by creating a task (which is not Basic Task). In the right pane, select ‘Create a Task’. In the General tab, give a proper name to the task. In the security options, you can select the user account too. So, the task will be executed only when the particular user logs on. Click Trigger tab -> New. Select ‘At Start up’ from the drop down. You can also set some delay for the task , e.g 5 minutes. This way, your task will run after 5 minutes of Windows start-up. In the Actions drop down, select start a program. You can see your newly created task name in the tasks list. In the right pane, you will see the options related to ‘Selected Item’. Click Run to see that the task performs the intended action correctly. Apply the trick discussed today and save yourself from the misery of opening a couple of web pages every time. Good tutorial. I prefer not to open websites at Windows Startup. Instead, I prefer to open websites automatically at browser startup. When I open my browser, it should open a default set of websites. Right now my settings are set to opening websites that were opened previously. This is because I open the same set of sites all the time. Another way of opening sets of sites is to bookmark them inside a folder and then opening the complete folder instead of opening them one by one. Opening the folder will open all the bookmarked sites inside it.